Guarantee your compliance! Employers are responsible for protecting employees’ rights and ensuring posting compliance. 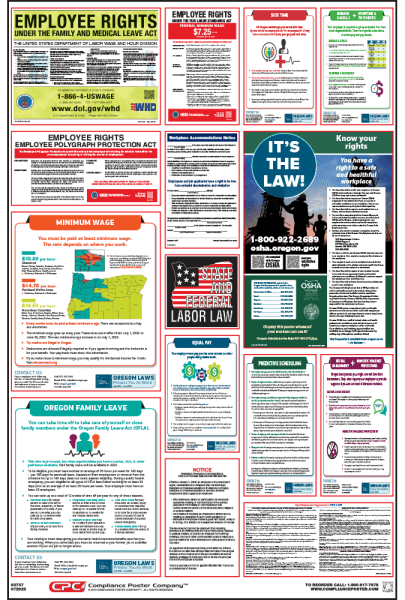 The Oregon Labor Law Poster fulfills all State, Federal and OSHA mandatory-to-post requirements for your workplace. Federal and State laws require employers to post notices informing employees of their rights and protections while performing work for their employers. Oregon Labor Law Posters contain each of the mandatory state and federal labor law notices that must be posted in the workplace. Employers may also be required to post a separate city or county poster depending on their location, or specialized posters relating to their industry. When only one labor law notice is updated with a mandatory change, you can instantly update your existing All-On-One™ Poster with CPC’s innovative Peel ‘N Post™ update sticker. A Peel ‘N Post™ is an adhesive-backed posting that sticks over the outdated posting on the All-On-One™ Poster. When multiple labor law notice updates are released at the same time, the most economical way to achieve posting compliance is to replace the outdated All-On-One™ Poster with the newer version. All-On-One™ Posters are updated with each mandatory and minor change as they happen, so purchasing a new poster is always an option. Equal Pay Law (June 2018) – New posting! This notice describes Oregon’s new pay equity and salary history law. Oregon Minimum Wage (June 2018) – Revised with rates from July 1, 2018 to June 30, 2019. OR-OSHA Job Safety and Health: It’s the Law! Employers must obtain a Workers’ Compensation Notice of Compliance Poster from the Oregon Workers’ Compensation Division and post it conspicuously in the workplace. Employers with at least $1,000 in payroll for a calendar quarter and employers who employ one or more workers during 18 different weeks in a calendar year must obtain an Employment Insurance Notice from the Oregon Employment Department and post it conspicuously in the workplace. Oregon No Smoking Poster: Oregon law requires No Smoking signs to be posted at every entrance and exit of an enclosed workplace or public place. Search Oregon products to find mandatory posters for specific industries. Visit our City/County Labor Law Posters page to see if your location is covered by any local posting requirements. Visit our FREE Labor Law Posters download page to see if your state has additional posting or notice requirements specific to your business.